Fulbeh Union Sierra Leone last Sunday held the second edition of their annual Fula Quiz and Debating Competition at the Miatta Conference Centre, Youyi Building. 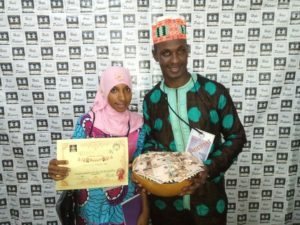 Newcomers into the competition, Western Area Fula Youths’ (WAFYA) Abdulai Omar Jalloh and Fatmata Jariue Jalloh ended up winning a very tight competition with 93 points. Last year’s winners Ghandal Forly however only managed to clinch the second prize with 91 points and the Progressive Fula Youths took the third prize with 89 points. Several Fula organisations were invited to send representatives of which eight organisations were selected including, Ghandal Forly, I’m Proud to be a Fula (84 points), Western Area Fula Youths, Fula Foundation (85 points), Haldi Fotti (83 points), Progressive Fula Youths, Pottal Fi Bhantal Fulbeh (86 points), and Sweet Pottal. However Sweet Pottal made a last minute withdrawal. Speaking at the event guest speaker, renowned Fula Chief and businessman, Alhaji Manoma applauded FUSL for their brilliant initiative which according to him would surely add value to the Fula language. He said such are the programs he loves to hear about and witness noting he himself realised of late that the Fula language has been disappearing among the youths in the country. Alhaji Manoma urged all who attended to speak the language at all times when in company of their tribesmen or at home to their children. He said the language is one of the most important thing that identifies a tribe and if the language disappears, then there is no tribe. However, he berated the Fula Community for not showing up in numbers to support FUSL insisting that he is highly disappointed. He said he expected to see a large turnout especially after the success of the first edition, but that they have disappointed him. He encouraged FUSL members to not give up and urged them to continue with the hope that someday, they would reap some benefit from their good work. President of Fulbeh Union Sierra Leone, Sallieu Bah (Elba) thanked everybody for coming. He said the aim of FUSL is to preserve and protect the Fula culture and tradition which he noticed has been disappearing lately. He noted that everybody is so focused on the Western Culture that we are virtually forgetting our own as Africans. He said the initiative came about as a result of the fact that there are several Fula youths out there who cannot speak the language or who are poor in speaking the language. Sallieu Bah informed that this is why as an organisation, FUSL decided to bring this annual competition which he believes would motivate the Fula youths to practice speaking the language eloquently and to understand some of the deep meanings of the language. He said he hopes that more of the Fula community would turn up in the next edition of the competition next year. One of the winners, Abdulai Omar Jalloh thanked FUSL for such a wonderful initiative. He said he was happy that they were invited to the program as they missed out last year. He said key reason for their winning was because they actually wrote the poem that they used in the program unlike their colleagues who actually searched the internet for theirs. He called on the Fula community to support FUSL in their future program as this would not be the last. The competition was done in three sessions. First session had to do with Quizzes on general knowledge of the Fula language and narration of some idioms in the language. The second session dealt with poems which were read in the Fula language and the third session had to do with an actual debate in Fula on four solid topics. The judges of the competition are renowned Fula Islamic scholars in the country including Sheik Umar Bah, Sheik Allieu Jalloh, Sheik Mahmud Bah and the Chief Judge Sheik Mohamed Sanusie Jalloh who did an excellent job of moderating the whole show. Mohamed Ramadan Bah of Culture Radio was the Chairman of the event alongside the Public Relations person of FUSL.